The Symbolic Decay exhibit is of Generative art, a contemporary remix of tribal symbols, with added rust and decay. 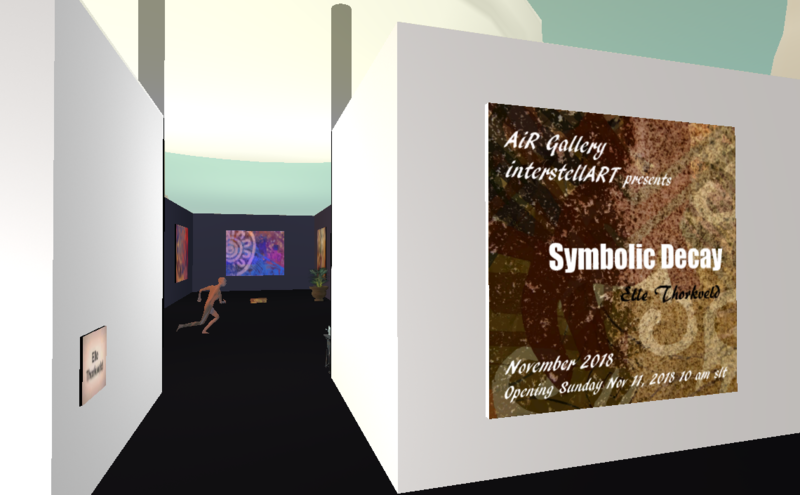 It is the November AiR exhibit on the InterstellArt sim. The digital art is by Elle Thorkveld, an artist focusing on generative and glitch digital 2D and 3D works. 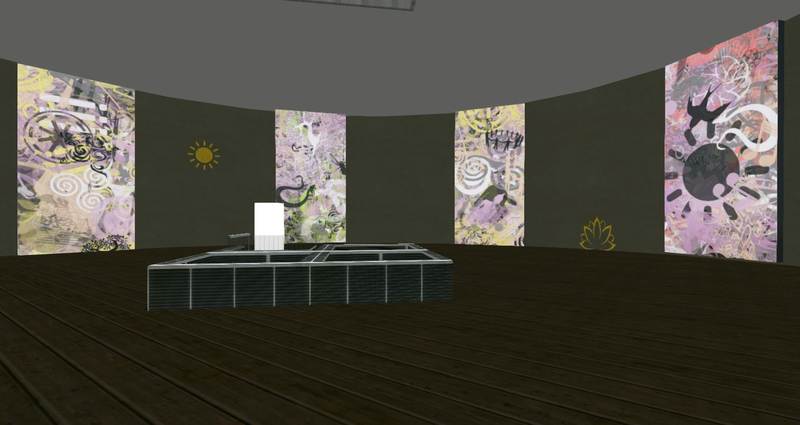 Elle says she enjoys creating SL sculpture, installations and experimental machinima. 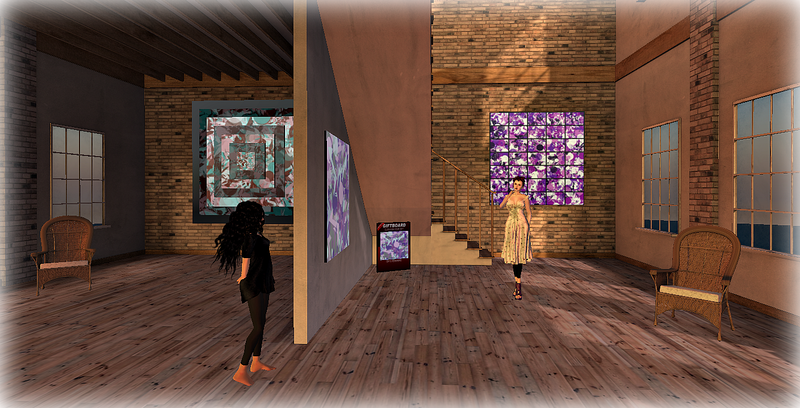 She is a SL and RL photographer, and a RL mixed media artist. Her work focuses on the use of color, novel combinations, movement, randomness & unpredictability. I enjoy Elle’s work and am especially drawn to the pieces in this exhibit. There will be an opening reception this Sunday, November 11 at 10:00 a.m. SLT. The exhibit runs through November. 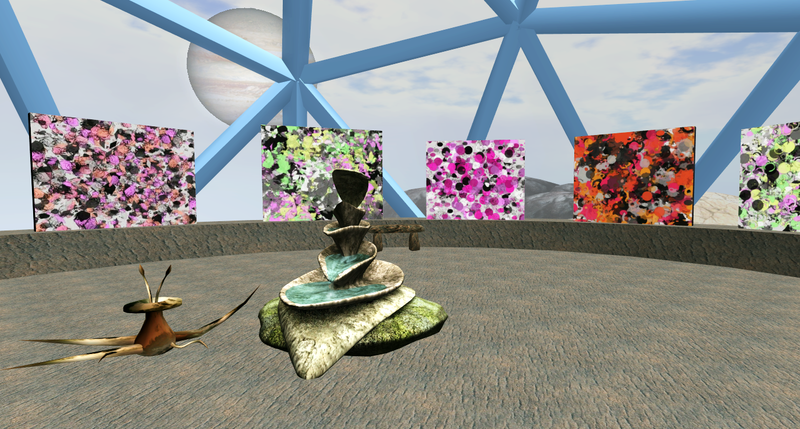 Virtual Artefacts is the November exhibit at interstellART AiR Gallery. 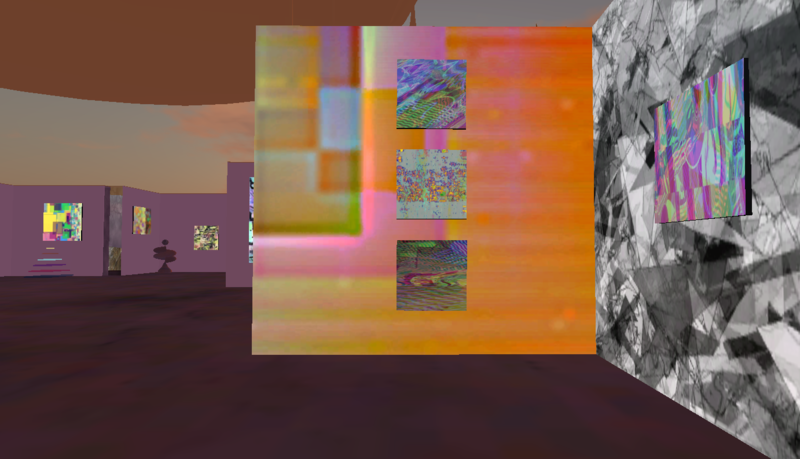 it’s a wonderful collection of generative and glitch process art by Elle Thorkveld; some of the pieces are animated including parts of the 3D sculpture shown in the photo above. The region light is shown in the photo above and perhaps you’ll find it the best to view the art. 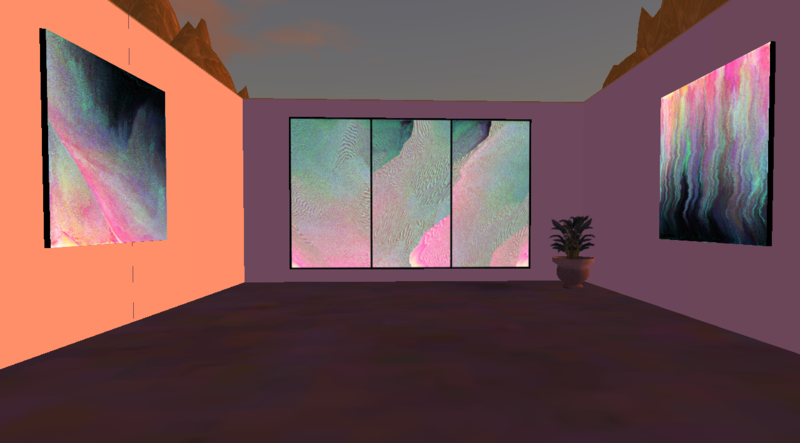 I chose sunrise setting on the Lab viewer for the purpose of blog photos. The exhibit opened on November 5th when I believed it to run through the end of the year. I am disappointed to learn that it is closing sometime during the last week of November. 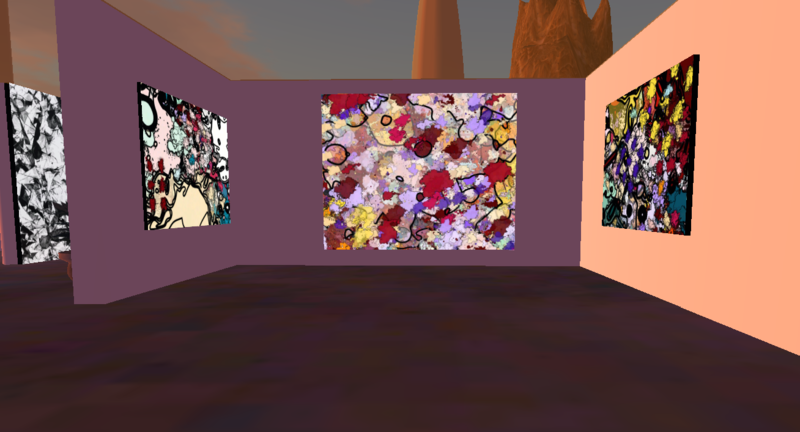 The pieces are grouped in different sections, some for sale and some not. I am hoping some of these works will be seen again. 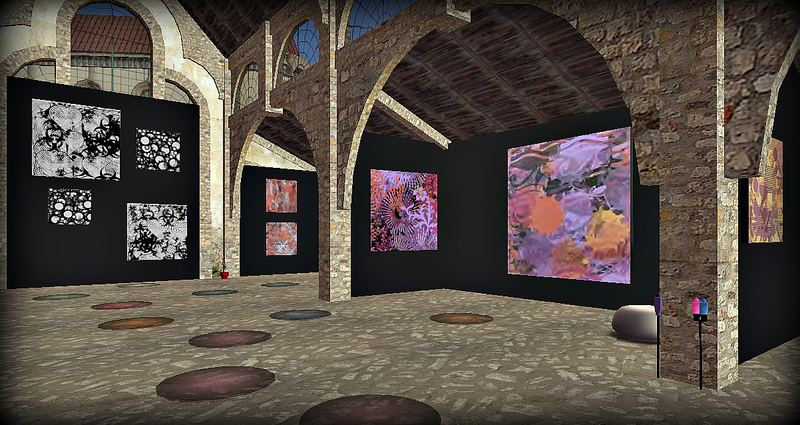 One of the most striking pieces is the 3D animated “walls” shown in the photo above. I filmed a 2:33 minute vimeo to document the piece which you can see here. 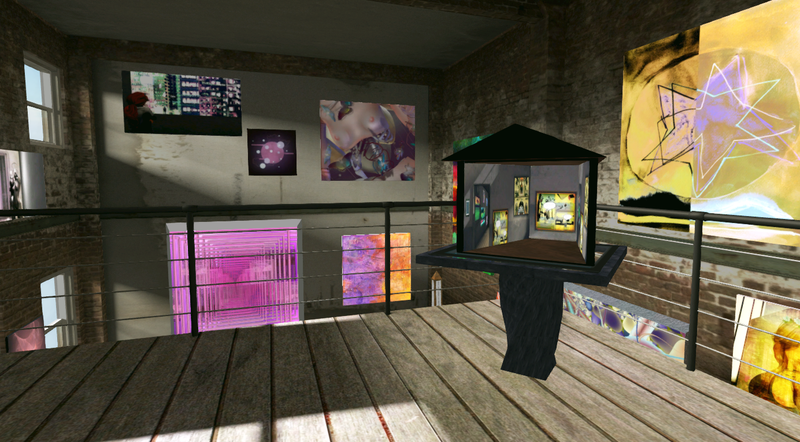 Elle’s Art Lot in Rivulet, Heterocera holds art collections, several on the ground, some in the sky accessed via teleporter. The Atoll ground texture is enhanced with wildflowers. The water around part of the land has lilies, swans and bamboo contributing to the views and restful feeling to the spaces. The parcel is harmoniously created for the surrounding area as well as expressing Elle Thorkveld’s art and individual taste. 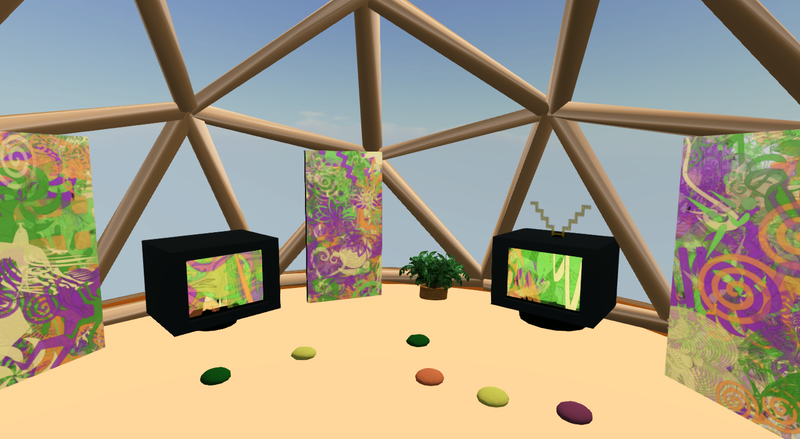 The TV Room is one of the galleries in the sky showing Elle’s art and was my first learning of the artist Nam June Paik. 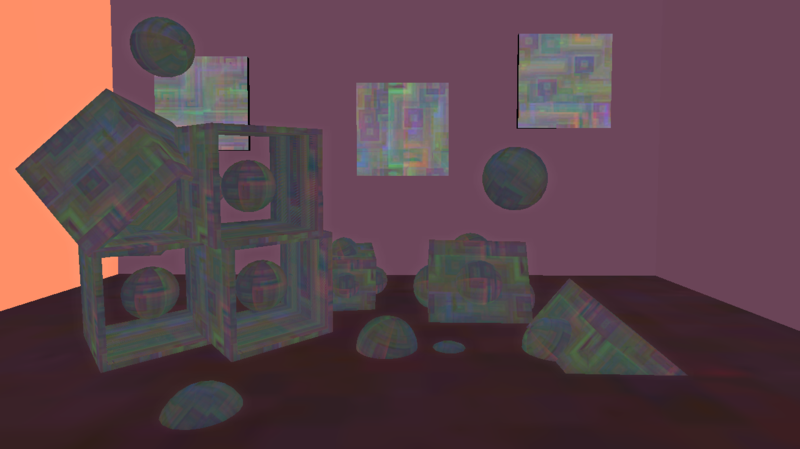 Elle Thorkveld is an artist focusing on generative and glitch digital art and music. She enjoys creating SL sculpture, installations and experimental machinima, is a SL and RL photographer and a RL mixed media artist. 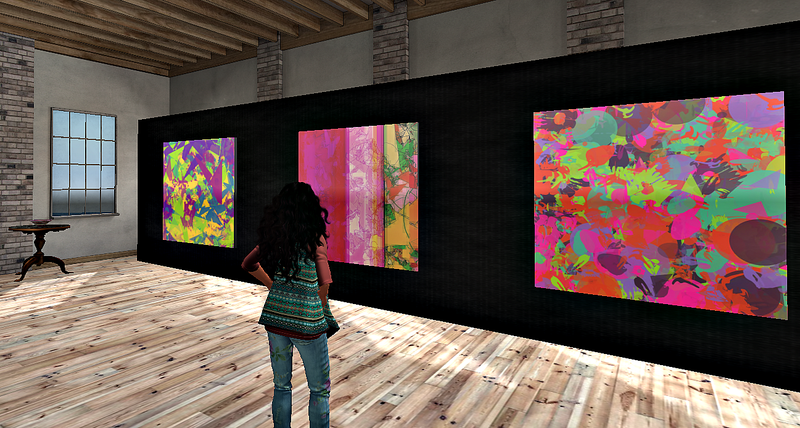 The Art Collection Gallery is very well curated by her with a sampling of the pieces she’s acquired. 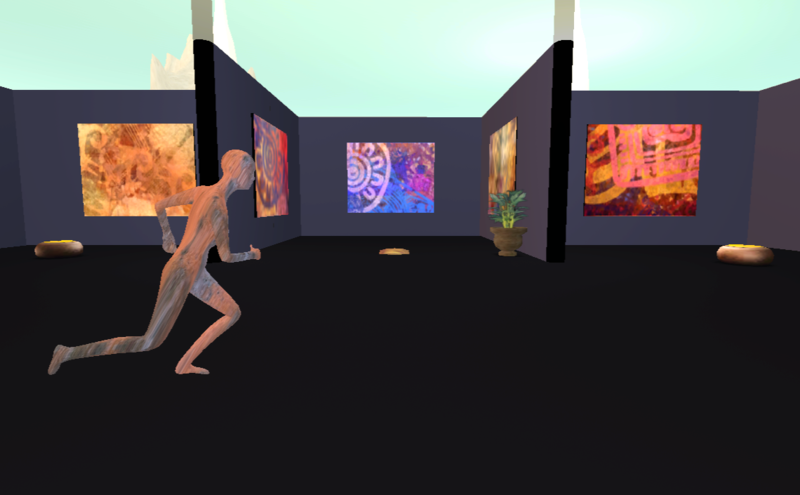 Another gallery has retrospective art on the ground level leading up to this room with two of my favorite pieces. This light-filled space is near the landing. 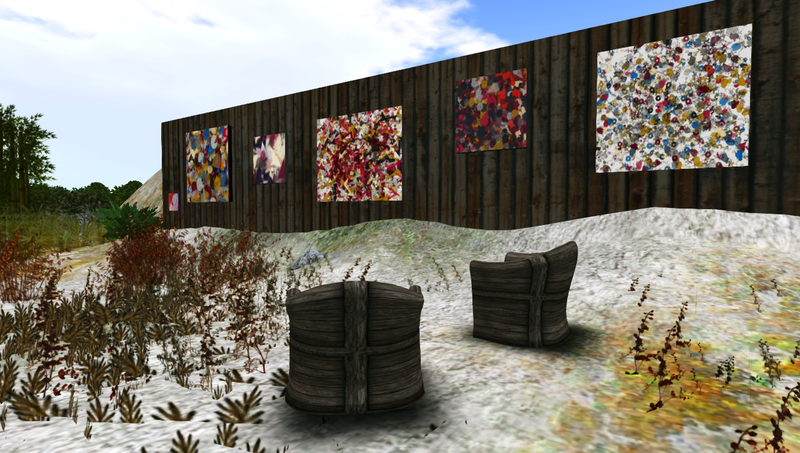 The above photo shows her exhibit at The Blue Zebra Project at Nimar. 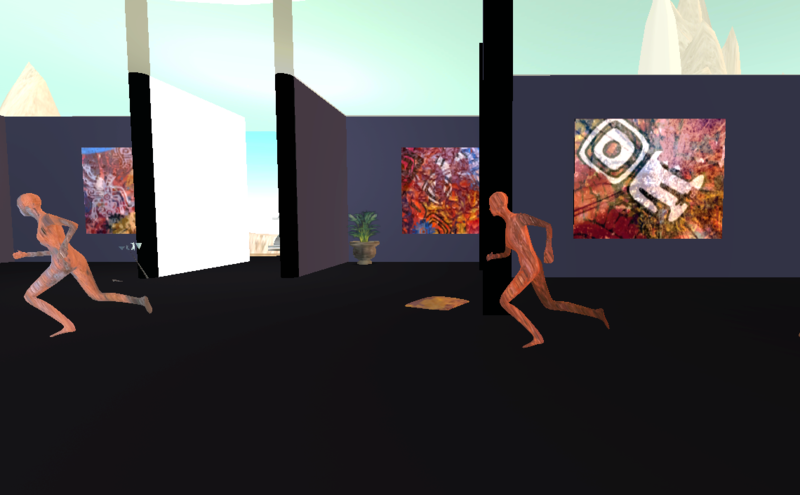 She has a colorful, animated 3D piece at Immaterial, University of Western Australia. She’s also exhibited at MBK Gallery and Montara Bridge Works. 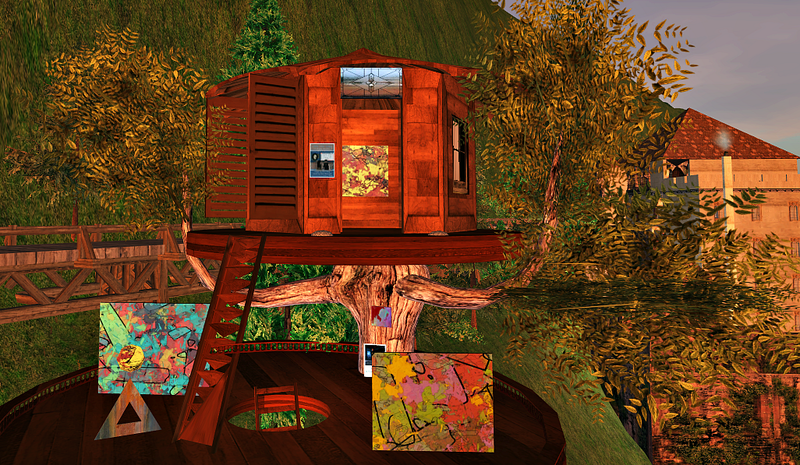 The Hillside Gallery on Heterocera is a treehouse exhibit. It’s a great starting place for exploration. It’s just off The High Mountain Road, seen in the left of the photo. As of this writing, you can hop off the tree house and walk across the land to the tracks where there are interesting places to explore, one seen in the background. There’s a rez zone nearby and a little further down the tracks to the right of what is shown here is a rest stop for travelers. Elle is also an active participant with Wanderlust Bench Art Park, Quentin and will be hosting the traveling Wanderlust Art Truck at her Art Lot in Rivulet beginning February 26th for about two weeks. Elle Thorkveld’s Alchemy Inspiration exhibit at Montara Bridge Works continues through the end of October. 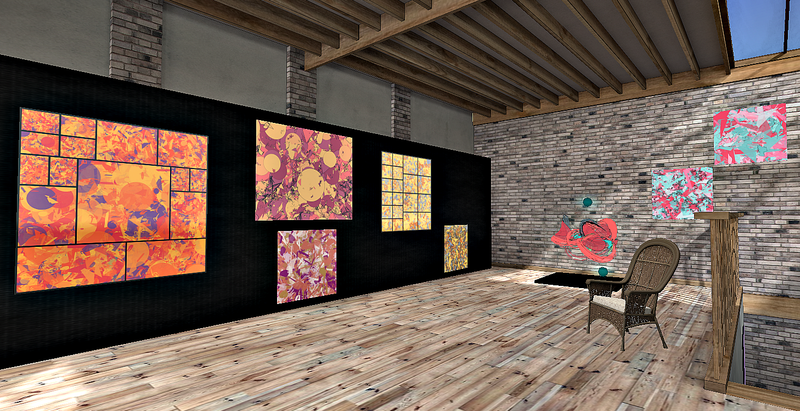 The exhibition features generative and glitch art derived from sketches created using Alchemy software. There’s an animated sculpture on the upper level. An informal artist chat was held on September 4th where visitors learned more about the process from Elle. 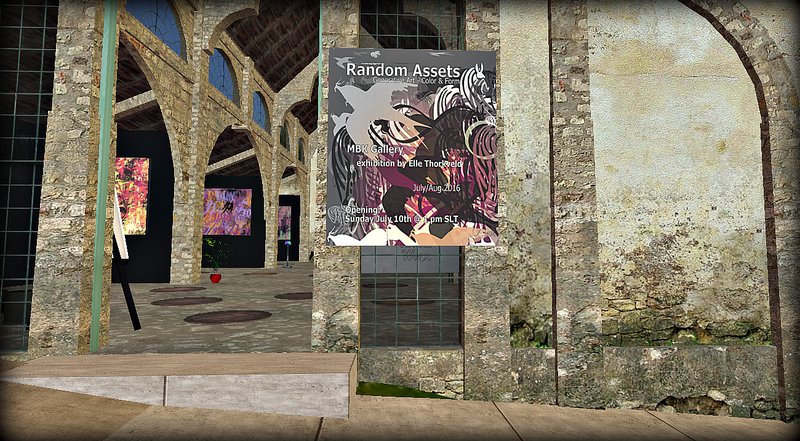 The art is available for purchase and a gift piece is available by clicking on the prim under the stairs. An artist bio and information about the exhibit is available at the gallery. 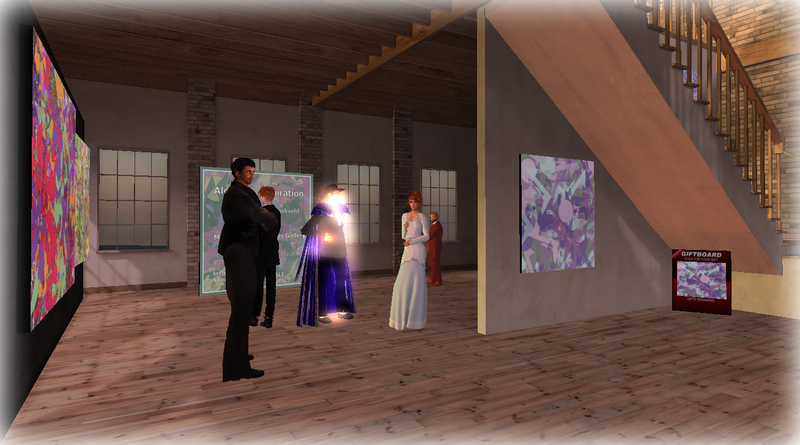 As curator of the gallery, the informal chat was enjoyable, seeing old friends stop by and meet other avatars. The conversation was lively and interesting, both on- and off-topic. Cordial invitation to visit the exhibition of artist Elle Thorkveld titled “Alchemy Inspiration” featuring generative and glitch art derived from sketches created using Alchemy software. 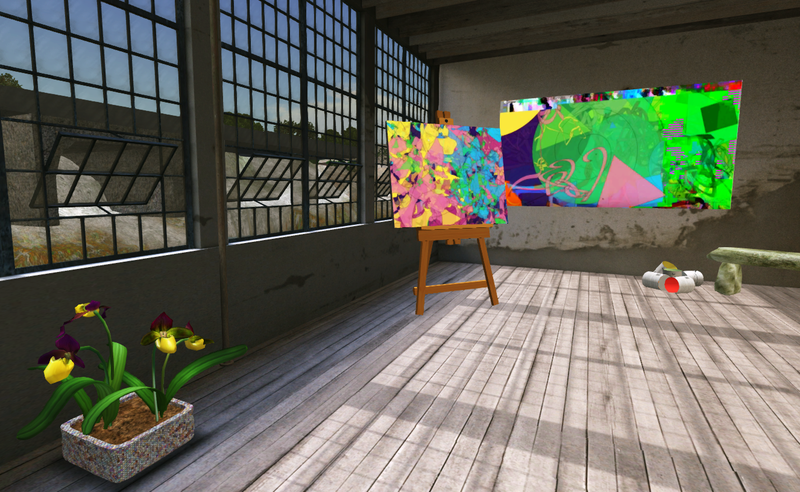 Informal artist chat Sunday September 4th @ 1 pm SLT. All welcome! Exhibit open September/October 2016 at Montara Bridgeworks Gallery. The July/August exhibit at MBK Gallery is titled Random Assets featuring Generative Art: Color and Form by artist Elle Thorkveld. 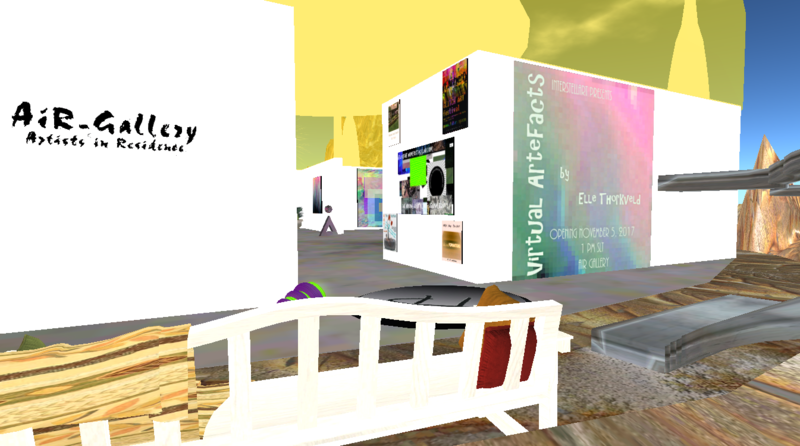 The opening party is on Sunday, July 10 at 1:00 p.m. SLT. 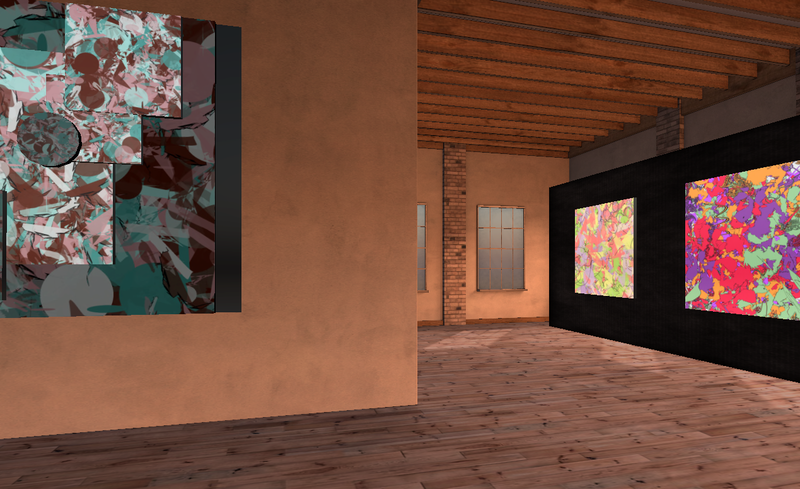 Elle creates both 2D and 3D works of art; this 2D exhibit includes animated 2D pieces. MBK Gallery is curated by Asmita Duranjaya, who has been hosting exhibits since 2009. 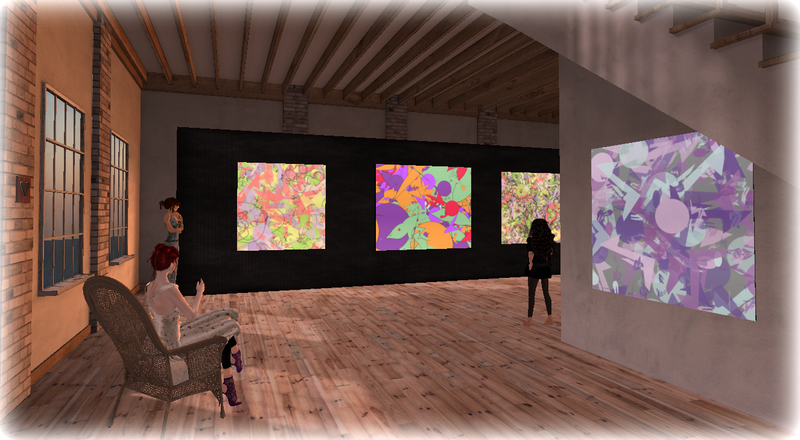 Many of the well known artists in SL have exhibited here including Silas Merlin in March/April of this year. There is a slideshow of posters inside near the front entrance. 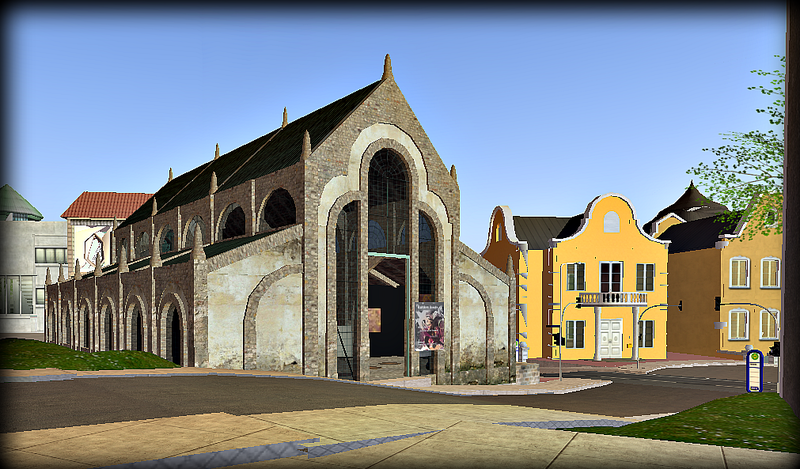 The gallery and sim is owned by Zewe Major and is part of a compound of six sims intended to look like a realistic Bavarian landscape.